You will also need an assortment of hand files to use on wood and metal. Files can be used to shape wooden fishing lures; for finishing metal molds, jigs, and other lures, for cutting tempered steel wire, hooks, metal hardware; and for finishing metal lips, propellers, spinners, and spoons. Hand files are also needed to keep other hand tools sharp and in proper working order. There are many different types of files in use but four will take care of most of your needs (see illustration below). The flat file is one of the fastest cutting general purpose files you can use. It has a broad surface and removes wood or metal quickly. You should get three flat files with different cuts. 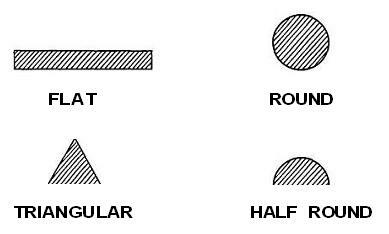 One should be a fine single cut which is used when a smooth finish is required. Another flat file should be a double cut type which is used for removing wood or metal at a fast rate. This file leaves a rough surface which must be finished with a smooth file. The other type of flat file should be a rasp which is used for rough work when you want to remove a lot of wood. Still another hand file you need is a half-round file which is also a good general purpose tool. It has a flat face for flat filing and a curved side for filing curves. This file can also be obtained in different grades of coarseness. A triangular or three-square hand file is used for filing metal smooth where small surfaces or corners must be worked. It can also be used to cut through heavy wire, rods, fishhooks, and other metal which cannot be cut with ordinary pliers. The triangular file is also handy for sharpening chisels, knives, and other cutting edges. The round hand file or "rattail" file, as the name implies, is round and tapered toward the end. It is used to enlarge holes and for filing small half-round curves. © 2004 Make-Your-Own-Fishing-Lures.com. All Rights Reserved.